Great Publications at a Great Price! Whether it's a back issue of The Madison County Musings, early Huntsville History, the History of Hindsville or a particular copy of the Madison County U.S. Federal Census, you have come to the right place. The Madison County Genealogical and Historical Society has over 150 publications for those of you who are interested in Madison County history and genealogy. All of our publications may be purchased by coming to our office and research library. We are pleased to announce that you may place orders on line now by using the secure services of PayPal. Back issues of The Musings and our many other publications and books can now by ordered by simply selecting the "Add to Cart" buttons found below each publication. Simply select any of the publications from the menu at the right. Your order will be sent by U.S. Mail. If you do not want to place your order on line, you may simply enclose a note giving the name of the publication that you wish to order, enclose your personal check, and mail to the society at the address listed above. You may also print a sheet which contains all of our publications by clicking on the link below. The Madison County Genealogical and Historical Society has several Madison County Histories for sale that you will enjoy. Simply click on the menu selections on the right to view information on these histories. All of them may be purchased by printing the order form above and mailing it to the Society offices at the address on the top of the form. Simply circle the books that you would like to order, read the shipping charges note at the bottom of the page. If you want more than one copy, write the number of copies that you want in the right margin next to price and description of the book. Of course, you can order on-line by using your credit card or your PayPal account. 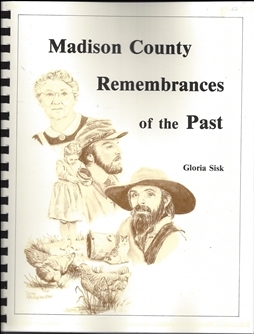 Originally published by Gloria Sisk in 1986 as part of the state and county Sesquicentennial celebration, this interesting book contains interviews with Madison County Residents and lots of historical information, 258 pages, indexed. This book has been out of print for years so get your copy while our supply lasts. The cost of this book is $15 if picked up at the Society office on N. Gaskill St.
You may also click on the "add to cart" button below where you may order with your credit card or paypal account. Cost by mail is $19. "This book covers the history, construction and operation of the large two-storied Presbyterian Church and adjoining school which was built on Community Hill in Kingston in the mid-1920's. The first graduating class was in 1925. Later a hospital was operated in conjunction with this Church and other social programs were offered to the people of the area which would not have otherwise been available. Many of the available programs were supported by the Board of Home Missions of the Presbyterian Church (especially the Brick Church) in New York state. The book presents the many factors that led to the closing of the school and the destruction of the two-storied Presbyterian Church in the 1940's." It is 261 pages long and has 108 photos in it. The cost is $29.00 which includes shipping! The society has published five books of marriage records as recorded by the Madison County Clerk. The Clerks have recorded the marriages in books that are simple titled Book G, Book, H, Book I, etc. Books A - F were destroyed by fire that occurred on Nov. 29, 1902. Many couples brought in their marriage certificates and they are found in Books G through J. Books G - Y are currently on file at the courthouse in Huntsville. The Society has extracted these records and published the first books in an easy to read format. Marriage Books L & M list all marriages recorded in Madison County from May 28, 1937 to January 12, 1951. The 5th marriage book is Early Marriage Dates in Madison County and contains 1,475 couples and were compiled from marriage certificates, family Bibles, cemetery monuments, etc. Many of the Madison County Cemeteries have been enumerated by Society staff members and other volunteers as a service for the Madison County Historical Society. Those cemeteries which have been enumerated are contained in thirteen different volumes. Cemetery Books #1 - #11, the Aurora area cemeteries, and the Cemeteries of South West-Central Madison County. Note: We have included the History of Witter, Arkansas (which includes the Witter Cemetery, Capt. Smith Cemetery, St. Peter's Cemetery, and several other small cemeteries in the Witter area) The History of Hindsville, Arkansas (which includes the Hindsville Cemetery, Vaughan-Whitener Cemetery, Evans Cemetery and Clark Family graves) as well as the History of Huntsville as it contains the Huntsville Cemetery enumeration under this category also as these three books contain cemetery enumerations as well. You may view the table of contents of these eleven volumes by selecting "Cemetery Books" on the menu to the right. The new Madison County Cemetery Book Volume 11 is hot off the press and available for shipping! Click on Cemetery Book #11 on the menu to the right for more information. This alphabetical index lists every topic which has been published in the Madison County Musings since 1982. You will enjoy simply perusing the lists to see what topics have been researched and written about the past 28 years. You may also type in the topic you are looking for, such as "Jesse Bird" into the search box and you will be pointed to the correct page where this listing occurs. If you find an article or articles that you are interested in, you may order any back issue of the Musings on line and charge to your Visa or MasterCard or you Pay Pal account. All transactions are secure through Pay Pal. A Chronological History of Huntsville, Arkansas was written by Huntsville Mayor Dr. Kevin Hatfield, in celebration of the 175th anniversary of the founding of the city. The book contains 19 chapters with each chapter describing the history of Huntsville by decade, beginning with the decade of the 1830's and ending with 2012. The first chapter describes the early Osage Indians who originaly occupied the area and their tribal chief, Hurachais, known as the "War Eagle". Click Here to see the Table of Contents of this book. You can click here if you wish to order a copy of this book on-line using PayPal. This fascinating trilogy about the lives and times of Madison County people was written and compiled by Carol Whittemore over a ten year period beginning with her first volume, Fading Memories I which was originally published in 1989. This 208 page volume contains 63 interviews of Madison County residents, 11 articles about Madison County History, 44 photos of people, places, and Schools. Click Here to see a full index of the contents of Volume I. This is the second volume of the series, published in 1992, about the lives and times of Madison County people was written and compiled by Carol Whittemore over a ten year period beginning with her first volume, Fading Memories I which was originally published in 1989. This 194 page volume contains 41 interviews of Madison County residents, 36 articles about Madison County History, 42 photos of people, places, and Schools. Click Here to see a full index of the contents of Volume II. This is the third volume of the series, published in 1999, about the lives and times of Madison County people. The series was written and compiled by Carol Whittemore over a ten year period beginning with her first volume, Fading Memories I which was originally published in 1989. This 200 page volume contains 31 interviews of Madison County residents, 20 articles about Madison County History, 39 photos of people, places, and Schools. Click Here to see a full index of the contents of Volume III. Simply click on the button below and order all three volumes at once and save on postage! Copyright © 2011. The Madison County Genealogical and Historical Society.